The Christian population of Turkey is evaporating rapidly. The nation, a NATO member since 1952, has experienced a reduction in its Christian population from 20% 100 years ago to only 0.2% today. The latest blow in the community occurred at the Hagia Sophia during Easter holy week. Istanbul was once known as Constantinople, founded by Roman Emperor Constantine in 324. He made it the capital of Rome before it fell to the Ottoman Empire in 1453. They made it their capital until the empire collapsed after World War I. Modern day Turkey officially renamed it Istanbul in 1923. Turkey changed the name, but current officials have clearly indicated a desire to return to the Islamist state established under the Ottoman Empire. The Turkish Council of Ministers, for example, formed the Istanbul Conquest Society to help organize a yearly event to celebrate the conquest of Constantinople. As columnist Constantine Tzanos asks, “Why would anyone want to celebrate the conquest “which not only by itself was a great human catastrophe, but it was also the precursor to many such catastrophes up to the very recent past?” The Ottomans terrorized the Balkans, killing anyone who did not convert to Islam. Historian H. Gandev believes “that 2608 Bulgarian villages disappeared,” while the “rural population decreased by a total of 112,144 households (or approximately 560,000 people).” The post-Ottoman Turkish government repeated their predecessor’s history with the Armenian, Greek, and Assyrian genocides in Asia Minor, which led to the deaths of over three million people. Turkey is not converting churches into mosques because there is a need for more mosques and Turkey does not have the resources to build them. The prime minister of Turgey Recep Tayyip Erdogan does not miss any opportunity to boast about the Turkish economic miracle under his leadership and the aspirations of his country to be counted as a great economic and political power. The message conveyed by those in Turkey who have achieved the conversion of Christian churches into mosques and demand the conversion of Hagia Sofia is that Turkey is an Islamic state and no other religion is tolerated. How can this be reconciled with the insistence of Turkey to join the European Union, which is founded on “the principles of liberty, democracy and respect for human rights and fundamental freedoms,” including the freedom of religion? In September 2014, Turkish Environment and Urbanism Minister Erdoğan Bayraktar claimed Christianity is not a religion, but a culture. China, India–only the U.S. believes in a single God. Spirituality and religious feelings are weakening. There are 2.5 billion Christians in the world. Christianity is no longer a religion. It’s a culture now. But that is not what a religion is like. A religion teaches; it is a form of life that gives one peace and happiness. That is what they want to turn [Islam] into as well. 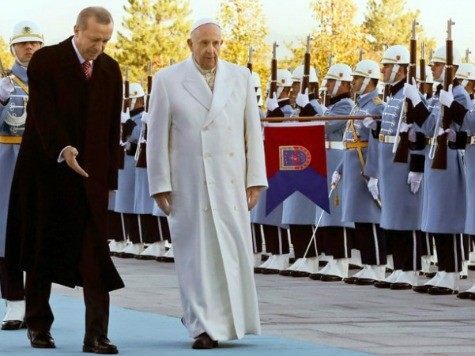 The Christian Broadcasting Network noted last year the dramatic changes within Turkey under then-Prime Minister Recep Tayyip Erdoğan and his Justice and Development Party (AKP). The country cracked down on the press and banned social media outlets. In 2013, Erdoğan promised to reopen the Theological School of Haiki, the main ideological school of Eastern Orthodox Christianity. Turkish officials closed it in 1971 in response to tensions with Greece over control of Cyprus. However, he only promised to do it if Greece promised to allow their Muslims to appoint their own mufti. This is nearly impossible, as Pinar Tremblay explains in al-Monitor. As president, Erdoğan has cracked down on both press freedom and the freedom of individuals to express themselves politically. Turkish law enforcement has arrested and fined numerous citizens for allegedly insulting Erdoğan, a crime in Turkey. It has also promoted Islamic ideals through the power of the state. Turkey became a mostly Muslim country due to a “population exchange” with Greece. In 1923, “more than a million Greeks were forced out of Turkey to Greece while 300,000 Muslims from Greece were relocated here,” writes Aktar. The Greeks who stayed faced massive taxes and anti-Greek programs, which eventually forced them out. The building of a church for Syriac Christians was first announced in 2011, when after two years of tussling and hairsplitting, the community secured approval from Erdoğan, who at the time was prime minister, and then-President Abdullah Gül. Both in 2011 and this time around, when the announcements were made of approval for the building project, no location was disclosed other than the general neighborhood. In 2012, Istanbul’s city government granted the Syriac Orthodox a plot to build a house of worship, but the Christians rejected the offer on the grounds that the allotted property was a Catholic cemetery and should be returned to its rightful owner. They insisted on a separate plot to build the church, but no offer was ever forthcoming. As a result, the church was never built, making some Christians in Turkey skeptical that things will be different this time.